If you love the curved edges and sparkle of a round diamond, but want something more unique, an oval diamond fits the bill. It’s often said that oval cut diamonds are somewhere between the round and the Marquise shape. 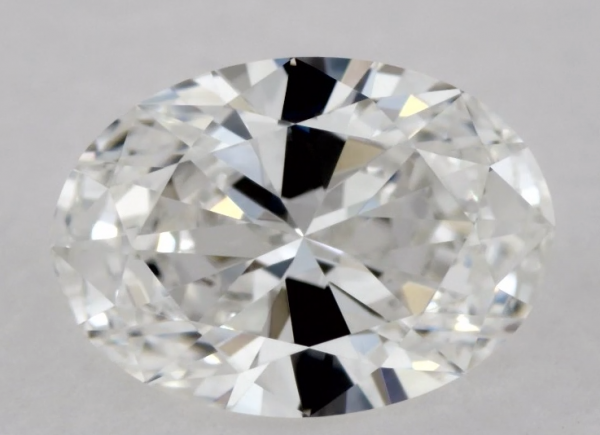 What is an oval shape diamond? 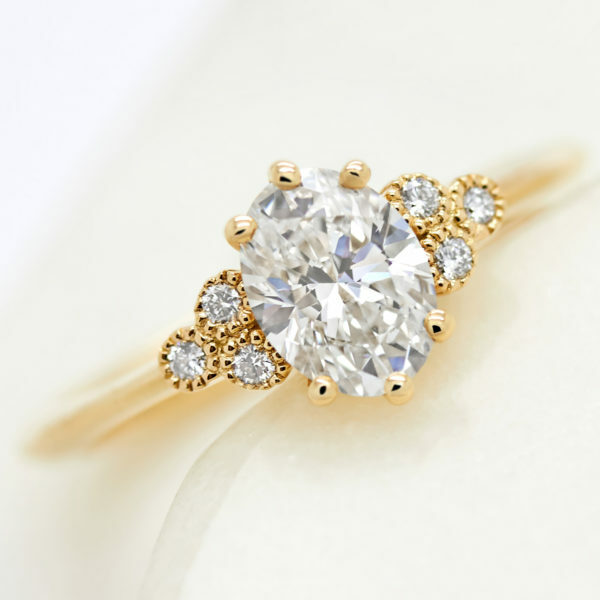 As their name suggests, oval diamonds are symmetrical, elongated rounded shapes which possess a similar level of fire and brilliance to that of a round diamond. 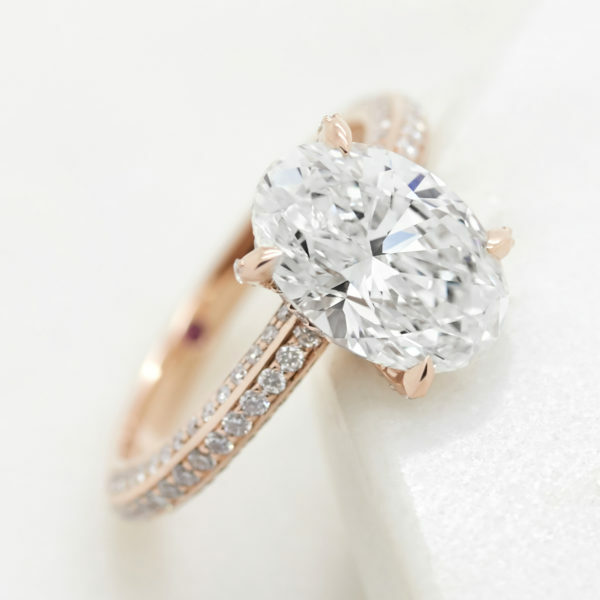 Why should I choose an oval diamond? With an increased surface area, an oval diamond optimizes carat weight; this means that oval diamonds often appear larger than a round diamond of the same carat weight–an impressive and economical choice. The elongated shape is also known to flatter the wearer by making the finger appear longer and slimmer. 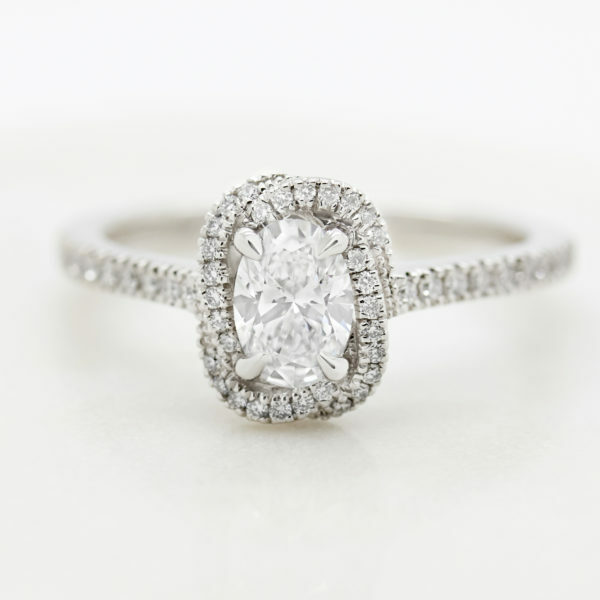 Oval diamonds make up around 15% of our engagement ring sales, making them the second most popular shape after round. Who’s wearing oval diamond engagement rings? In recent years, oval diamond engagement rings have seen an increase in popularity, with stars like Hailey Baldwin and Blake Lively leading the trend. What ratio oval should I choose? Oval diamonds are available in ratios (length divided by width) from 1.30 to 1.60, with the most popular between 1.30 to 1.45. What’s your ideal ratio? It’s a matter of personal preference–a larger ratio will give a narrow, long oval shape, elongating the wearer’s finger, while a smaller ratio will give a more rounded shape, often more likely to prevent a bow tie effect. Oval diamonds can possess a bow-tie effect, which occurs when the light doesn’t bounce into the middle of the diamond, because of the way the diamond is cut. This appears as a bow-tie shape darkness visible in the center of the diamond. While most agree that this a part of an oval diamond’s beauty, a severe effect, as shown, is undesirable. All of our diamonds are hand-inspected by our diamond buyer to ensure they do not possess a strongly visible bow-tie. What is the best cut for an oval diamond? 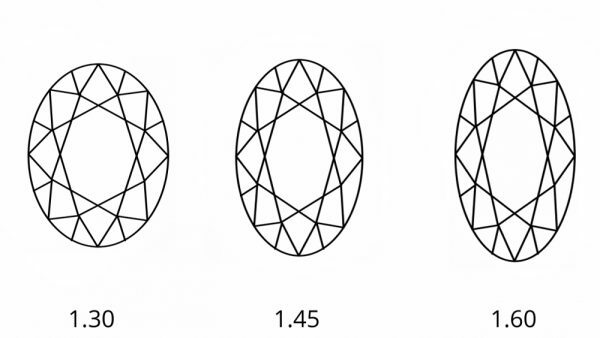 While oval diamonds don’t have an official cut grade, the chart below offers general guidelines to follow when considering the cut of an oval diamond. 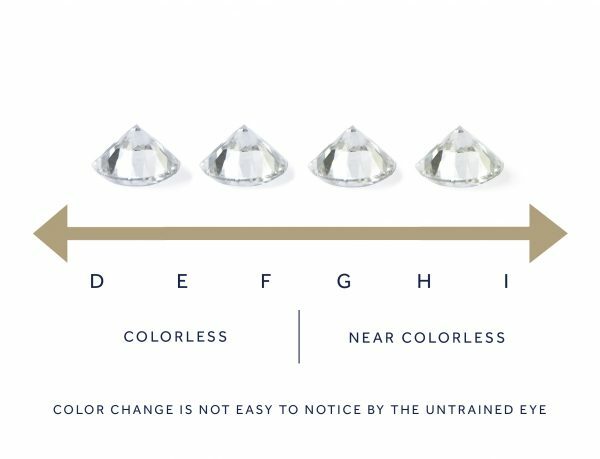 Choosing color grade in oval cut diamonds is entirely dependent on the preference of its buyer or wearer. 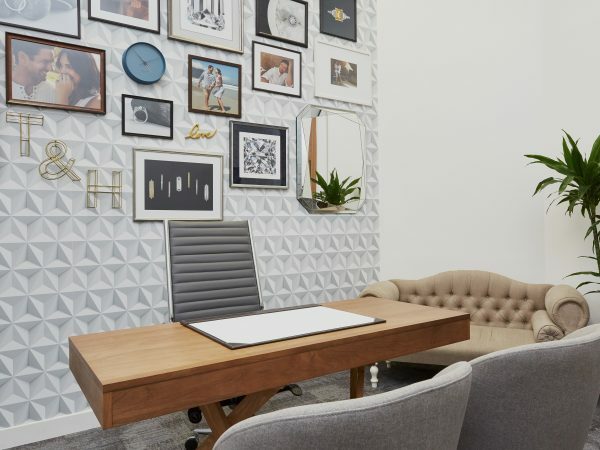 Some customers prefer the warmer tones of color grades G-H to the icy cool tones of color grades D-F. In fact, if you’re choosing a rose gold or yellow gold setting, choosing a diamond with a color range G-J is a great choice. The warm tones from the metal will mask any minor color present in the diamond. In reality, the difference between these two color grade ranges (colorless and near colorless) is difficult to perceive, especially to the naked eye. What clarity is best for an oval diamond? Clarity really is dependent on personal preference. When diamonds are formed deep in the earth, they develop clarity characteristics–slight irregularities visible under 10x magnification. Depending on the size, quantity, placement, tone or color of these clarity characteristics, they may or may not be visible to the naked eye. This is one of the reasons why a truly flawless diamond is so rare. To ensure the brilliance and fire that makes oval diamonds so enchanting, we recommend SI1 clarity grades or higher.